Posted on 23 November 2013 at 10:41 pm. I’d been driving my car for a while knowing that there was an odd bumping and grinding noise by the front passenger tyre, but being a real girl, I ignored it and hoped it would go away. It didn’t. The kids could hear it too. Realising that we were about to do a long drive to London to see lovely Susie and her family, I finally got the car to Andy’s garage. ‘Hmm’, he said as we drove, ‘this doesn’t sound right’, and when he got it up on the ramp, it wasn’t. The suspension was fractured and the wheel could have fallen off. Ooops. ‘You’re not going anywhere’ he said and stood firm in the face to my protests that I needed to collect the kids from school and get home. As Dumbledore said, it is often harder to stand up to our friends, than our enemies, but stand up to me he did. So I was going nowhere fast. So I phoned a friend. I phoned Emma who went to collect the kids and then they helped her find me. She drove us home. I helped her with her CV. Andy meanwhile had found a new part, and fixed the car within a 2 hour window. Emma went home with her kids and then came back to get me. My kids didn’t want to come out into the dark again with me at night so went across the road to Ruth. Emma dropped me at the car. I came home. The next day Ruth’s son came over in the morning. Our weekend with Susie was lovely and our family holiday plans are coming together well (of which more later). Becky’s been round for a catch up and share. I’ve done some co-coaching Angela and with Ali. I’ve given information to L about a situation she’s in, I’ve listened to S about how he’s feeling. This week I’ve worked long days down in mid Wales so Ruth has had my boys some nights and I have had her son some mornings. Then whilst down in mid Wales, the windscreen wipers went again, in the rain, at night, on the long way home…so I tiptoed home, knowing Ruth would hold onto the kids and the next day Andy again, took charge of the car. What’s my point? Who are these people? Who cares? Well it’s all about friends innit? I’d have been completely stuffed in the last two weeks without them. They’ve bailed me out practically with car fixing, lifts and child care. They’ve listened. laughed, coached, planned, and empathized. They have made my life richer emotionally, socially, practically and even financially. Andy doesn’t charge me ‘mates rates’, but I trust the work he does and know he’ll do his best for me. Ruth saved me a fortune on child care and Emma on taxis. I’d like to think I’ve been a good friend too. Helping Emma with her CV, listening to and supporting L and S. Having Ruth’s son in the mornings, coaching for Ali and Angela. What have you done to help people this week? How have you been helped? How did you show appreciation? Apart from the car, no money has changed hands, only time and care and how much better it feels. Sharing money is lovely when it happens, it is great to be able to treat people to presents or visits and it is lovely to receive them. But money alone is not IT. Eldest son said the other day ‘Are we rich mum’? On paper the answer is ‘no’, absolutely not. But in how we live, we are. I’ve been having my head massaged by Angela (amazing…get in touch with her if you’re local) in exchange for some coaching. 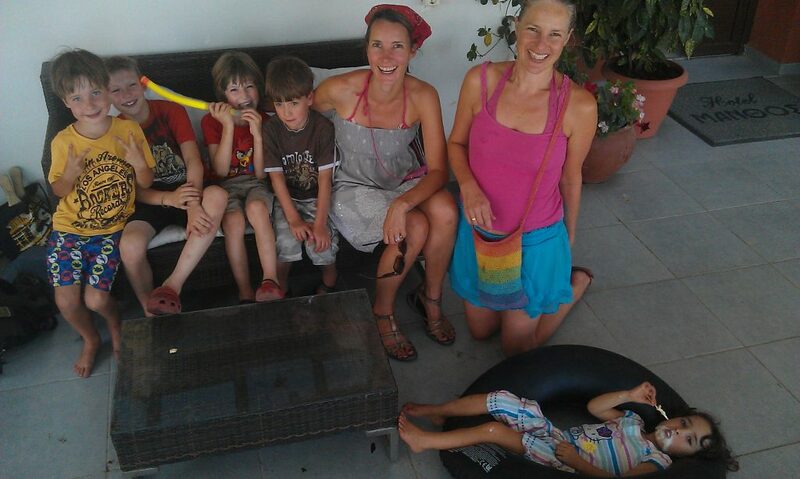 My kids and I had a month in Greece as I worked there. I didn’t make money, but I we did get a ‘free’ holiday. The guy that fixed our roof is a friend, the girl who does our hair is our friend, we even made friends with the workmen who closed the village bridge for 5 months. We are rich in Social Capital which James Coleman in Wikipedia describes as ‘social capital is anything that facilitates individual or collective action, generated by networks of relationships, reciprocity, trust, and social norms’. ‘Social capital can only be generated collectively thanks to the presence of communities and social networks’. Thatcher got it so wrong when she said there was no such thing as society, only the individual. Each of us are individuals within society and we cannot act without it having an effect on that society. If we withdraw from society, we keep our skills and talents from the world. When we are paranoid and distrusting we distance ourselves and thereby prove to ourselves others can’t be trusted. When we expect the best in people, they show it. I never for a minute doubted that they guys working on the bridge wouldn’t treat our garden with respect and they did. When we share our time, compassion, skills and presence we grow richer in the doing of it. Our connections grow, our roots deepen, our heart warms. Helping other people feels good. Being helped is a humbling gift for which I am grateful. Who could you help/support/listen to/ care for/ appreciate next week? Thank you to our friends for your help these last few weeks. My life is richer for your presence.